The Sarah Jane Adventures is a British science fiction television series, produced by BBC Cymru Wales for CBBC, created by Russell T Davies and starring Elisabeth Sladen. The programme is a spin-off of the long-running BBC science fiction programme Doctor Who and focuses on the adventures of Sarah Jane Smith, a middle-aged investigative journalist who, in her youth, had numerous adventures across time and space. The series debuted on BBC One with a 60-minute special, entitled "Invasion of the Bane", on 1 January 2007. A full series of ten 25-minute episodes followed, beginning on 24 September 2007. The first series consisted of five two-part stories, and a second series, comprising six two-part stories, began airing on 29 September 2008. A third series, once again comprising six two-part stories to make a total of twelve episodes, with Russell T Davies serving as executive producer, aired from 15 October 2009 to 20 November 2009. The fourth series aired from 11 October 2010. Another spin-off series, Sarah Jane's Alien Files, was shown concurrently with each of the first episodes of the stories. Filming for three of six two-part serials planned for the fifth series was completed prior to Elisabeth Sladen's death on 19 April 2011. Although some UK media, including the Sun, reported in early May 2011 that production of the series was to continue, the BBC has stated explicitly that no further episodes will be filmed. The fifth series was broadcast starting 3 October 2011 on Mondays and Tuesdays. It finished just two weeks later on 18 October 2011. In 2006, Children's BBC expressed an interest in producing a Doctor Who spin-off. Their initial idea was "a drama based on the idea of a young Doctor Who", but Russell T Davies vetoed this. "Somehow, the idea of a fourteen-year-old Doctor, on Gallifrey inventing sonic screwdrivers, takes away from the mystery and intrigue of who he is and where he came from," said Davies. He suggested instead a series based on the Doctor's former companion Sarah Jane Smith. The character of Sarah Jane Smith, played by Sladen, appeared in Doctor Who from 1973 to 1976, alongside Jon Pertwee as the Third Doctor and later Tom Baker as the Fourth Doctor. A pilot episode for another Doctor Who spin-off series, K-9 and Company, made in 1981, featured Sarah Jane and the robot dog K-9; however, a full series was never commissioned. Sarah Jane and K-9 returned to Doctor Who in various media many times over the years, most notably in the 20th anniversary special "The Five Doctors" (1983), and in episodes "School Reunion" (2006), "The Stolen Earth" (2008), "Journey's End" (2008) and The End of Time (2010). Sarah Jane is frequently voted the most popular Doctor Who companion by both fans and members of the general public. The prospect of a new television series focusing on Sarah Jane was first rumoured in The Sun in March 2006, prior to the airing of "School Reunion"; the report at that time suggested that Sarah Jane and K-9 would both appear in the series. The fact that a Sarah Jane series was being developed was first confirmed in the BBC's in-house newsletter, Ariel, in early August 2006. These early rumours were associated with the working title Sarah Jane Investigates. K-9's only appearances in the show's first two series were a cameo in the special and an appearance in the last episode of the first series. This was due to the concurrent development of the independently produced children's series, K-9, which features a remodelled version of K-9 with only indirect nods to Doctor Who. However, in 2009 the canine robot appeared with the Sarah Jane Adventures cast in a sketch for Comic Relief, and K-9 appeared in 6 episodes of the third series. In addition to Sladen, the first series of the programme stars Yasmin Paige as Maria Jackson, Sarah Jane's 13-year-old neighbour (in Ealing, London) and Tommy Knight as a boy named Luke, who is adopted by Sarah Jane at the conclusion of the introductory story. The third member of Sarah Jane's young entourage is 14-year-old called Clyde Langer, played by Daniel Anthony, who is introduced in the first episode of the proper series. Porsha Lawrence Mavour plays Maria's friend, Kelsey Harper, in the special. Maria and her family are written out of the series in the first story of the second series, The Last Sontaran, but Maria and her father return briefly in the second part of The Mark of the Berserker. In the second story of that series, The Day of the Clown, several new regular cast members are introduced: Rani Chandra and her parents, Haresh, and Gita (played by Anjli Mohindra, Ace Bhatti, and Mina Anwar, respectively). Joseph Millson appears throughout the first series as Maria's recently separated father, Alan, with Chrissie Jackson, Maria's mother, played by Juliet Cowan. One other regular is Alexander Armstrong of comedy duo Armstrong and Miller, who provides the voice of Mr Smith, an extraterrestrial computer in Sarah Jane's attic. The main cast of Series 2–4. Clyde, Sarah Jane, Luke and Rani Chandra. The 2007 special featured Samantha Bond as the scheming villain Mrs Wormwood and Jamie Davis as her PR agent Davey. The first series included among its guest cast Jane Asher as Sarah Jane's childhood friend Andrea Yates, Floella Benjamin as Professor Rivers, who returned in Series 2, Series 3 and Series 5, and Phyllida Law as Bea Nelson-Stanley. The second series guest starred Bradley Walsh as an evil alien clown in the story The Day of the Clown and Russ Abbot as a sinister astrologer in Secrets of the Stars. Also appearing in the second series were Gary Beadle and Jocelyn Jee Esien, who portrayed Clyde's parents Paul and Carla in The Mark of the Berserker; Esien reprised her role briefly in Series 4 and more prominently in series 5. Nicholas Courtney guest starred in Enemy of the Bane as classic Doctor Who character Sir Alistair Lethbridge-Stewart, and Samantha Bond also reprises her role as Wormwood for the episode. The fourth series in 2010 was executive-produced by Russell T Davies and Nikki Wilson, and the producers were Brian Minchin and frequent writer Phil Ford. This team remained in place for the completed episodes of Series 5. The show's abbreviated fifth and final series features a new main character named Sky, played by Sinead Michael. 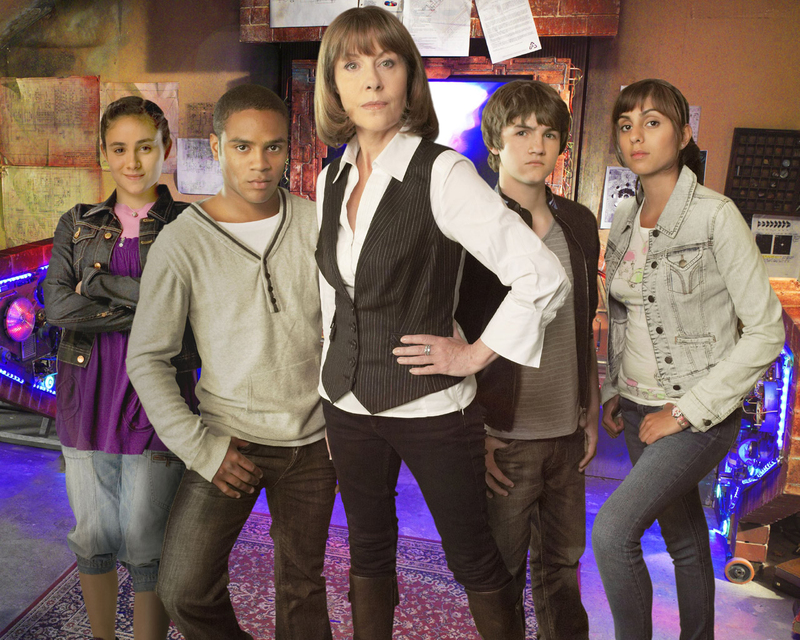 The Sarah Jane Adventures was first seen by its original British audience in the form of a 60-minute New Year's Day special in 2007, titled "Invasion of the Bane", which was co-written by Russell T Davies and Gareth Roberts. Though it may have appeared so to the viewing audience, "Bane" was not a pilot. Instead, it was a holiday special. Nevertheless, because of the atypical broadcast order – holiday specials in Britain typically air after the regular run of the series to which they're attached – the story had many conventional introductory elements common to pilots. Creator Russell T Davies has commented upon the exceptional broadcast situation, saying "Sarah Jane Adventures is slightly unusual in that it was commissioned before we'd written the script. If we'd written a load of rubbish, they'd still have had to make it." He refers to "Invasion of the Bane" simply as the "first episode". The story focused on Sarah Jane's investigation of a popular and addictive soft drink called Bubble Shock!. Series one of the show aired in September of that year, consisting of five two-part half-hour stories. Individual half-hour episodes aired once a week on BBC One, with episodes airing a week ahead on children's digital channel CBBC. The final part aired in November 2007. The second season started in September 2008 using the same format, with six stories instead of five, ending the season in December. The third season started 15 October 2009, twice weekly (Thursdays and Fridays) on BBC One from 15 October to 20 November. Due to the illness of Elisabeth Sladen, and her subsequent death on 19 April 2011, filming for the second half of the fifth series, which was due to air in the autumn of 2011, was postponed and later cancelled. Filming for three stories of the fifth season had been completed. The final series started to aired from 3 October to 18 October 2011 on CBBC and ended with a tribute to Elisabeth Sladen in the form of a video montage of scenes from SJA and Doctor Who.